Morgan James Publishing, 9781630476250, 240pp. Whether you want to be CEO of a large corporation, lead a sales team, inspire your organization, or just be a better person, It's Already Inside shows with real-life examples how to get there. Author Robert Murray shares amazing stories packed with life lessons, from growing up with legendary athlete Terry Fox to running with singer Billy Idol and running from grizzly bears, having a colleague die in his arms, standing on top of Mount Kilimanjaro, and being arrested in Hong Kong. This entertaining journey of personal discovery and the awakening of your authentic self will show you what you need to do to achieve happiness and success. 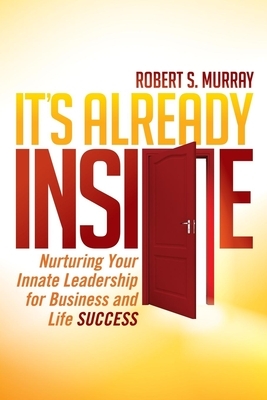 Robert "Bob" Murray, an international keynote speaker, transformational leader, strategy yoda, and author, is the award-winning partner at Incrementa, a Vancouver-based strategy, leadership, and business optimization organization. Bob has spoken on strategy, transformation, and leadership to audiences in more than twenty-five countries and has led eighteen startup and turn-around initiatives from concept to success, including billion-dollar business turnarounds with more than 1,600 employees and five major business acquisition and integration projects. He has faced unimaginable personal adversity in taking various businesses through the "Journey of Transformation" to help them and people reach their full potential.